In Eastern Ukraine is going a replay of the Crime scenario with pro-Russian protesters taking government buildings, declaring “independence” and announcing referendums for joining Russia. It is obvious at the end Russia will have to accept this and annex the problematic regions. And it is logic the West and the coup d’état government in Kiev to blame Russia for “provocations”. But the real problem is not with Russia. It is with the West. After Ukrainian economy almost crashed, protesters took over the power in Kiev and Russians in Ukraine started to ask Putin for help, after all this, the answer of the west was… IMF. If Putin wanted to worsen the situation, he could hardly do better. Bringing IMF as an answer to Ukrainian crisis is a type of execution. A point-blank fire. IMF is an economic help organization suitable for stable countries that have only economic problems. These problems can be very deep and to need painful reforms, but they are only in economy. Politically and on international arena, the country is stable. Just at the moment Ukraine is not in such situation. It is in a deep political and existential problem. The official and last legitimate power was removed. The legislative body is ruling via some kind of non-constitutional revolutionary decrees. At least some of the voting in Parliament is under suspicion of being forced by military groups from fascist militias. Big parts of country are not recognizing this new power and one part even succeeded to secede and join another country. And in this super crisis situation, the West is answering with… IMF. IMF is a global institution that has very strong rules. It requires deep and painful economic reforms that require strong government. In fact not one government has lost power after implementing IMF recipes. So what can happen with these recipes in Ukraine with a weak government not even recognized by all of the population? Ukraine now needs an enormous emergency aid, just to survive. You cannot make a surgical intervention (IMF) before stabilizing the patient. You cannot in this situation devalue the currency and lower further even current super low incomes of people. You can not stop the subsidies for the natural gas, allowing its price to rise almost 100%, and crush the standard of living and big shares of the industry. Generally you can not implement IMF reforms in an almost dismantled country. The things that Ukraine needs are much different. It needs a massive financial aid, just to stabilize to the pre-crisis levels, until the political mish-mash is ended. I.e. it needs someone on West to find $20-30 billion immediately to stabilize the economy and compensate the economic sanctions that Russia imposed on Ukraine (limiting the Ukrainian export to Russia and cancelling the gas price discounts). But no one thinks about this. Instead the West sends IMF and lays emphasis on aggressive rhetoric against Putin. But you can not make IMF reforms that require sacrifices from poor people, by doing this relying on an illegitimate government not accepted by big shares of the country. You can not do this with a government without strong army and police. And finally you can not cut pensions and salaries while just months before Russia offered another plan without all this and containing real and big cash. The IMF reforms are capable to shatter even a strong country. With Ukraine they are capable of blowing up the country. 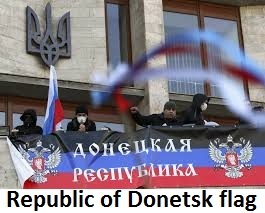 In fact from economic point of view Russia has no interest of annexing Eastern Ukraine. Crimea was annexed, but it was a low populated area with only 2 million citizens. East Ukraine means 10-15 million people. I.e. by annexing it Russia will increase its population by 10%. Such an operation is equivalent to accept he same number of refugees. You will have to find money to pay pensions and salaries there and to create or at least – to keep alive, government institutions. It is the same as USA suddenly and in 1 day to accept 40 million new illegal immigrants (10% of population). Can it survive such a hit? Such type of annexation is very risky and Putin is well aware of this. So he has no interest in escalating the Ukraine crisis. His interest is to protect Russians inside Ukraine by some kind of autonomy, religious and language rights. For Russia is better the population of East Ukraine to remain paid and fed by Ukraine and by the West, instead of joining to Russia. So the pure real politics fact is that by sending IMF and destabilizing country the West is moving the situation towards new and risky for Russia actions. It is not clear if it is done deliberately, or is done by stupidity. Or is just a demonstration of the weakness of the West that is already not capable to be active and to pay for helping problematic countries. Anyway the final result of all this will be a big financial burden for Russia, dissolved Ukraine and very angry, but mostly in verbal area West. The real win-for-all situation is saving Ukraine as one country by injecting big money and accepting a federal constitution that will make the Russians protected from the West Ukraine nationalists. Unfortunately the most probable result will be something like almost-lost-for-all.